Few creatures of horror have seized readers' imaginations and held them for so long as the anguished monster of Mary Shelley's Frankenstein. The story of Victor Frankenstein's terrible creation and the havoc it caused has enthralled generations of readers and inspired countless writers of horror and suspense. Considering the novel's enduring success, it is remarkable that it began merely as a whim of Lord Byron's. "We will each write a story," Byron announced to his next-door neighbors, Mary Wollstonecraft Godwin and her lover Percy Bysshe Shelley. The friends were summering on the shores of Lake Geneva in Switzerland in 1816, Shelley still unknown as a poet and Byron writing the third canto of Childe Harold. When continued rains kept them confined indoors, all agreed to Byron's proposal.The illustrious poets failed to complete their ghost stories, but Mary Shelley rose supremely to the challenge. 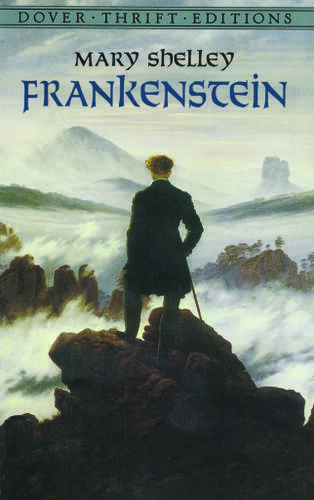 With Frankenstein, she succeeded admirably in the task she set for herself: to create a story that, in her own words, "would speak to the mysterious fears of our nature and awaken thrilling horror — one to make the reader dread to look round, to curdle the blood, and quicken the beatings of the heart."